If the photos you want to share are in one Moment, tap the Share button next to the Moment that has the photo or photos you want to share, and then, choose Share this moment, which shares all the photos in the Moment, or Share some photos, which opens another thumbnail view of the moment where you tap each photo you want to share. If you want to share photos from several Moments, tap Select in the upper right corner and then tap the photos you want to share. Albums: Tap the album that has the photo or photos you want to share. Tap Select in the upper left corner and then tap the photos you want to share. iCloud, Facebook, Flickr, Print, or Copy: Unlimited, although Flickr and Print don’t support Moments selected as a group. They must be selected using the Select button and then tapping the photos individually. (Optional.) 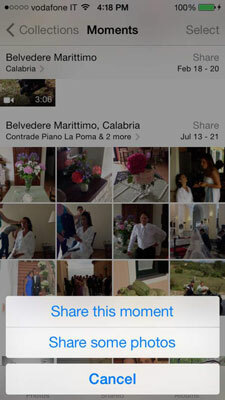 Add the selected photos to a new or existing album by tapping Add To at the bottom of the screen. A list of albums created on your iPhone opens. Tap the album you want to add the photos to or scroll to the bottom and tap New Album, in which case the New Album dialog opens where you type a name and tap Save. The selected photos are added to the existing or new album. (Optional.) Delete the selected photos by tapping the Delete button. When you Delete a photo from an album, other than Camera Roll, the photo remains on your iPhone in Camera Roll, but is removed.